Suitable for 2-4 guests, 2 bedrooms, 1 bathroom, well equipped kitchen, lounge- dining area with cathedral ceiling and wood fire . Free parking on site. Private outdoor decking area great for that escape from the hustle and bustle of modern life or a romantic weekend away. ENTIRE COTTAGE available for that perfect place to settle into your French Island experience with panoramic sea views of the south coast of French Island. 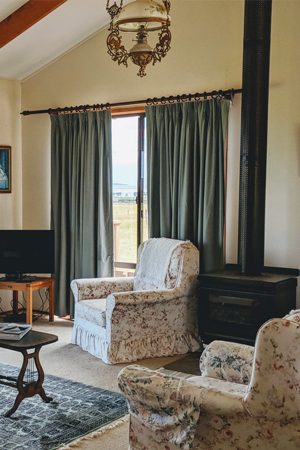 You have the sole use of the entire cottage and all the comforts of home with flat screen tv and dvd player. Before you arrive, you can request that we provide breakfast provisions including good coffee and tea, free range eggs , cereal, fruit or homemade jam. Children can help us on the farm if they like by feeding the animals hay and chaff or alternatively, they can go koala spotting or fossicking along the coast. Bedroom 1 – A double bed and built in robes. Bedroom 2- Two single beds and built in robes. Bathroom features a bath/shower ,vanity basin, soap, hairdryer. Separate toilet. Kitchenette – Oven, microwave, gas hotplates, toaster, coffee plungers, full size fridge, well stocked crockery and cooking utensils. Lounge /Dining features comfortable couch and chairs, dining setting, wood fire, flat screen TV and DVD, stereo player. Outdoor decking has gas barbecue, outdoor furniture and lovely views of Westernport in a very private and tranquil setting. Cost per night – $265.00 which includes pick up and drop off at ferry terminal. Discount for booking 2 nights or more. Chez Ele provides comfort, cleanliness and calm and a wonderful opportunity to enjoy the peace and solitude of this island retreat. Take a walk to the seafront and explore the south coast at your leisure. Enjoy the solitude of pottering along a lonely coastline. Relax on the verandah of Chez Ele and watch the sun sink into the glistening sea. Hire a bike and explore the islands back roads. See Australian wildlife up close. Marvel at the amazing stars of the “Milky Way” on a clear night. Go fishing – bait can be purchased at the General Store on the island.